Establishing the Rotary Club of Dexter was originally the vision of G. Philip Zepeda, a member of the Rotary Club of Ann Arbor North, who also spearheaded the founding of the Rotary Club of Chelsea. Pastor Larry Courson (above, center) joined the other 24 charter members after he was sent to Michigan from California to establish Peace Lutheran Church in Dexter. Larry was not only a Rotarian but had been the president of his Rotary Club in California and agreed to be the charter president. 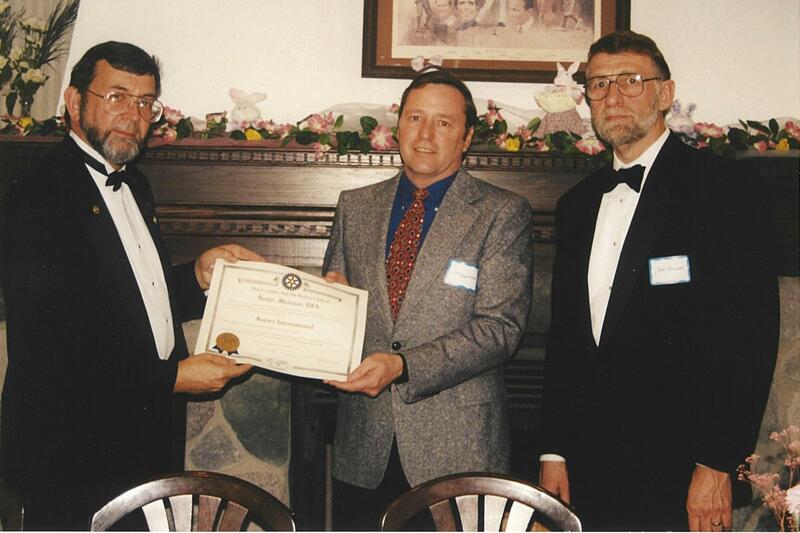 Dexter Community Schools Superintendent and charter member John Hansen (above, right) served as the Master of Ceremonies for the gala Charter Dinner on Saturday, March 28, 1998, at Reddeman Farms Golf Club, where Rotary District 6380 District Governor Steve Youtz (above, left) presented the charter certificate. The 20th Anniversary Celebration and President's Dinner will include reflections of past presidents, highlights of accomplishments through the years, plenty of time for socializing, and will conclude with the pinning of the 2018-2019 president, Rick Vanden Heuvel.